The NFL playoffs will be underway tomorrow, and even though TV ratings have steadily gone up during the 2018 regular season after a couple of years of worrying decline, the league’s efforts of boosting viewership are still ramping up. Tech enthusiasts interested in learning the basics of the game but too ashamed to ask their friends for pointers, as well as too lazy to Google that stuff, can now get answers from Alexa to all their burning questions. As the name of a newly published Alexa skill suggests, “The Rookie’s Guide to the NFL” includes all the info needed for a football neophyte to understand what tomorrow’s Colts vs. Texans clash is all about. No query will be ignored, no matter how elementary, starting with “how many players are on a team?”, “who is Tom Brady?”, and “who won Super Bowl 52?”. But the voice-enabled app, reportedly developed by the National Football League’s own Digital Lab division, can also be useful for Echo users that already know a few things about the sport. For instance, you can clarify more in-depth stuff, like subtle differences between certain positions on the field, descriptions of popular formations, fouls and sanctions, and even learn interesting bits of trivia about players and teams. Getting The Rookie’s Guide to the NFL naturally requires as little effort as any other Alexa skill. You simply have to activate the feature on Amazon’s dedicated webpage (free of charge), then tell Alexa to “open NFL”, “launch NFL” or “start NFL” on your supported Echo smart speaker, Fire tablet, or a phone like the Moto X4. 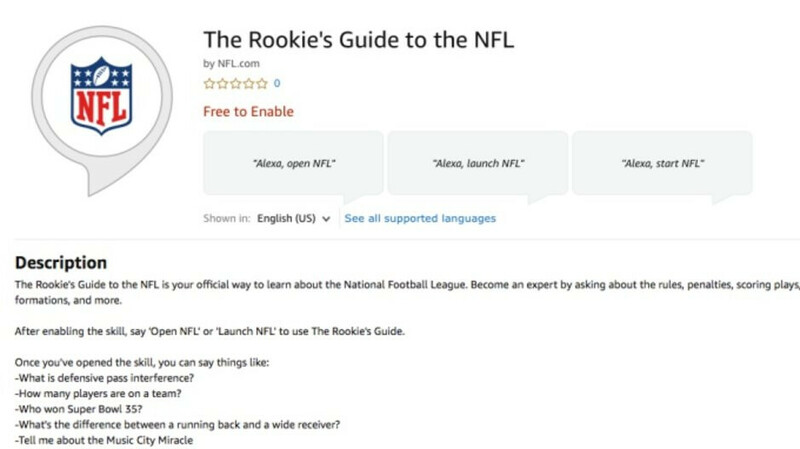 The Rookie’s Guide to the NFL is technically the association’s second Alexa skill, following in the footsteps of a flash briefing-type app called “NFL in :60”, which is now integrated in the standalone new voice-commanded skill. In addition to those 60-second recaps of top football stories (updated several times a day), the app also includes a five-minute podcast previewing every playoff round, as well as the Super Bowl.